News and views from around the world of the Friends of the Western Buddhist Order (FWBO) and Trailokya Bauddha Mahasangha Sahayaka Gana (TBMSG). 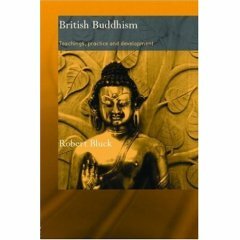 British Buddhism : Teachings, Practice And Development by Robert Bluck. When you’re deeply involved in something it can be difficult to get a clear idea of how it looks from the outside. This is especially true of religious groups. How does one’s own group compare with similar groups? Are our own ideas orthodox or innovative? Are our internal narratives of identity consistent with how others see us? Using these dimensions allows the author to attempt a comparison of the groups that on the surface at least look very different from each other. Stephen Bachelor has suggested British Buddhist Groups constitute a spectrum that ranges from conservative traditionalist, to radical innovative. Bluck shows that this analysis is not sophisticated enough to account for the seven groups in his survey. He proposes instead that groups must be seen as occupying a spectrum within each of his seven dimensions – they may be conservative in some aspects and innovative in others. An example might be the way that even orthodox bhikkhus in the west will out of necessity handle money at times. His overall conclusion is that despite differences in emphasis, these groups share a strong “family resemblance” and that many of the issues that the groups face in trying to establish themselves are the same. Of the seven groups, the NKT, Soka Gakkai as well as our own FWBO, are labelled “New Religious Movements”. All three have also been somewhat controversial: they tend to describe themselves as orthodox but are seen by outsiders as being innovative; they also are seen, especially by more traditional groups, as being too active (too successful?) in seeking converts and building their organisations. Bluck is conscious of the difficulties of writing about controversial groups and says at the beginning of the FWBO chapter that: “it is important to steer a middle course between promotion and prejudice here”. The restrictions of space mean that the chapters on each movement are all too brief. At times the glosses are over simplified, but on the whole it does seem that Bluck has managed to keep to his middle course. Although I am not well versed in those traditions, the chapters on the other controversial groups seem confirm this, as he presents his observations in a neutral tone. Bluck has drawn heavily on writing by Sangharakshita and Subhuti, but includes material from a few other authors, as well as interviews conducted with order members. He does not seem to have interviewed non-ordained members, and his informants seem not to represent a true cross section of the movement. Although things are brought up to date with interviews as recent as 2004, Bluck does seem to lean heavily on books such as Subhuti’s Buddhism for Today which was published in 1983 and seems a little dated these days. Criticisms, both from within and without, are dealt with in a straightforward way. The FWBO Files get a couple of mentions, but Bluck concludes that the criticisms from without are largely unfair. He points to the conscious isolationism of the movement as a major cause for the continuation of such criticism, and a loosening of that policy as bringing more positive engagement with the wider Buddhist Sangha. The charge of protestant Buddhism gets an airing again but the point seems of little interest outside academic circles. Bluck appears to have underplayed some aspects of the FWBO. For instance he does not seem to grasp the idea of right-livelihood as a spiritual practice, and doesn’t deal with it under the heading of practice. There is no mention of Buddhafield, or the growing influence of the green movement; or of the international flavour of the FWBO, and particularly the influence of the Ambedkarite movement in India on the FWBO as a whole. The intended audience for this book is academic. The text is peppered with quotes, however keeping all comments and citation information in the text and instead of relegating them to foot- or endnotes does improve the readability. With academic writing it is important to be aware that certain words are tacitly used as technical terms in a way which may be unfamiliar. In the FWBO for instance we do not think of Sangharakshita as being a “charismatic” leader, but in the terminology of the sociology of religion definition he clearly is. The full price of US$120 or UK£65 means that this book is likely to be out of the price range of most of my readers. It’s also not available in high street bookshops, but can be purchased online, often at a substantial discount. Despite being inaccessible to most people it would be a very good idea if every FWBO centre and retreat centre owned a copy as it is a valuable resource. As an outsiders view that is not evidently prejudiced it gives us important insights into our movement.